Viruses are small infectious agents that replicate only within the cells of living plants and animals. Viruses are approximately ten times smaller than bacteria and consist of a nucleic acid (DNA or RNA) wrapped in a thin coat of protein. Viruses cause many different diseases such as the common cold, chickenpox, polio, and Acquired Immunodeficiency Syndrome (AIDS). Some types of the Human Papilloma Virus (HPV) can cause cancer. Viruses are transmitted by direct contact with the blood and/or secretions of an infected person. The transmission may involve inhaling droplets produced when an infected person coughs or sneezes, but some viruses, such as yellow fever, are usually transmitted by bites from insects that have previously fed on an infected person. Viruses penetrate the cell walls of body tissues bringing a payload of DNA or RNA that starts replicating inside the infected cells. When the cell dies, multiple copies of the virus are released and continue to infect other cells. The human body sometimes is able to build antibodies that prevent the replication of the virus to stop the infection. Vaccines consist of weakened viruses that stimulate the body's defenses to fight infection by the natural viruses. Vaccination was developed by Edward Jenner (1749-1823), an English country doctor, who observed that milkmaids who got infected with cowpox only got a weak version of smallpox but did not get smallpox itself. Smallpox was greatly feared at the time because it killed one third of its victims and the survivors were left with unsightly scars. Jenner published his results in 1798. World-wide vaccination programs eliminated smallpox infections in 1977. Polio can cause partial or total paralysis. The polio virus enters the body through the mouth and attacks the nervous system. Vaccination with the Salk and the Sabin vaccines has reduced polio infections globally from 350,000 cases in 1988 to 1,652 cases in 2008. Polio is now endemic only in Nigeria, India, Pakistan, and Afghanistan, but great efforts are being made to eradicate it. In 2011, there was only one case of polio in India due to the implementation of an aggressive vaccination and monitoring program. The Global Polio Eradication Initiative put in place a plan for stopping all wild poliovirus transmission in the world. The program was dealt a setback when Taliban gunmen killed nine female health workers who were immunizing children against polio in Pakistan in December 2012. The Taliban had described the anti-polio campaign as a cover for CIA espionage activities. Class I - double stranded DNA. Class II - single stranded DNA. Class III - double stranded RNA. Class IV - positive single stranded RNA itself acting as mRNA. Class V - negative single stranded RNA used as a template for mRNA synthesis. Class VI - positive single stranded RNA with a DNA intermediate in replication. Class VII - double stranded DNA with an RNA intermediate in replication. Although viral diseases such as AIDS and yellow fever have major economic and social impacts, they do not cause the panic caused by Influenza. Both AIDS and yellow fever can be controlled by common hygienic practices and by preventing insect bites. Influenza is a viral infection of the respiratory and pulmonary system generally accompanied by fever. It is hard to prevent influenza because it is contracted simply by the act of breathing. The high mortality associated with the great pandemics, such as the 1918 Spanish flu, elicits greater vigilance from monitoring agencies like the U.S. Center for Disease Control, and the World Health Organization. A genus is a biological taxonomic category ranking below a family and above a species and generally consisting of a group of species exhibiting similar characteristics. Influenza Types A, B, and C are different genera. Type A viruses are subject to gradual mutations (antigenic drift) as well as sudden changes in their surface proteins (antigenic shift). Because of their variability, Type A viruses can cause major pandemics. Type B viruses undergo only antigenic drift and cause more localized epidemics. Type C viruses are antigenically stable and cause only sporadic disease. What is Bird Flu and Swine Flu? Bird flu or avian influenza is an infection of birds by the Type A influenza virus. Similarly, swine flu or swine influenza is an infection of pigs by the Influenzavirus A or C. Variants of the influenza virus can also infect humans. Several human deaths from the Influenzavirus A (H5N1) in Thailand and in Turkey and deaths in Mexico from influenzavirus A (H1N1) have caused concern that the virus may mutate into a form that is easily transmitted from person to person thus causing a pandemic as devastating as the 1918 Spanish flu. The outbreak of swine flu in Mexico in 2009 was caused by a virus with a reassortment of components from influenza strains endemic in humans, birds, and swine. The best prevention against contracting the influenza virus is to use face masks to avoid inhaling particles with viruses from infected persons, washing the hands after touching light switches and door handles, and avoiding touching the eyes, nose, or mouth with unwashed hands. Type A viruses are divided into subtypes based on differences of two surface proteins called hemagglutinin(H) and neuraminidase(N). There are 16 different hemagglutinin subtypes and 9 neuraminidase subtypes. The designation H5N1 refers to a specific combination of hemagglutinin and neuraminidase subtypes. 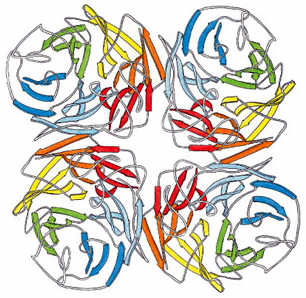 Hemagglutinin and Neuraminidase have complex protein structures. They are antigens that stimulate an immune response, especially the production of antibodies. 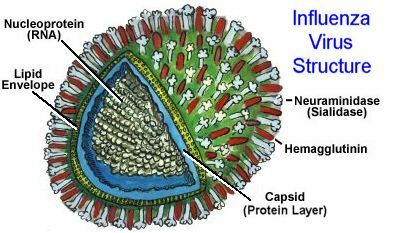 The influenza virus is about 0.1 micrometers (millionths of a meter) in size, which is approximately ten times smaller than the width of bacteria like E. Coli. The following electron photomicrograph shows the surface protrusions of hemagglutinin and neuraminidase as bright specks on the surface and the edges of the virus. Hemagglutinin is a glycoprotein that binds the virus to the cell being infected. There are 16 hemagglutinin antigenic subtypes which are labeled H1 through H16. 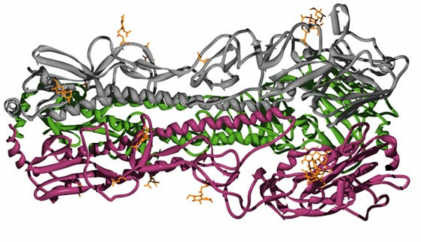 The hemagglutinin molecule is actually a combination of three identical proteins (shown here as gray, green, and purple) that are bound together to form an elongated cylindrical shape. A mutation that changes just one amino acid in the protein structure can alter the antigenic properties significantly. Neuraminidase is an enzyme that helps the virus to breach cell walls. Neuraminidase is also known as sialidase because it breaks the linkages between sialic acid and cellular glycoproteins and glycolipids found in cell walls. There are 9 neuraminidase antigenic subtypes labeled N1 through N9. Neuraminidase forms mushroom-like projections on the surface of the influenza virus. The top consists of four identical proteins with a roughly spherical shape. The picture below shows how each of these subunits is rotated by 90 degrees relative to the center of the arrangement. Flu virus electron photomicrograph © Linda Stannard, of the Department of Medical Microbiology, University of Cape Town. Articles and links on viral infections from the United States National Library of Medicine. Directory of factsheets, news reports, and articles. The differences between bacterial infections and viral infections are important.